Home / Archive by Category "Race Results"
A race characterised by fickle light and dying winds and an increasingly strong Spring tide. Only two marks were set, aiming (unsuccessfully) to keep the competitors clear of Kew Bridge. As the river was still quite low at 15:30, the start was delayed for 15 minutes awaiting more water. James’s and David Berger’s (on loan from Rob Collingwood) Enterprises both achieved prompt starts, but an almost immediate lull stranded the other four boats, putting them a lap behind. After 40 minutes James had completed 4 laps and David two, but it was clear that the elements were now against us, and the race was ended at that point. In fact nobody else managed to complete more than one lap, and ultimately the rescue boat was fully occupied retrieving stranded boats from the environs of Kew Bridge. Four boats started the D-course on this afternoon with North Easterly blustery wind, two Enterprises (Porpoise sailed by James, and Rob Collingwood’s Tiamat sailed by Josh and Caroline), a Vibe (Backwash, Ian Nethersell), and a Laser ( Phoebe, Rob Adams). In the first few minutes all were together, however by Chiswick Bridge Rob and James had broken away and the fleet began to stretch out. Conditions meant for much leaning out on the beat downstream and although the fleet was somewhat becalmed by Chiswick Pier, progress was only halted momentarily. The buoy was laid just downstream of the Corinthians starting line, with Rob coming round first, followed by James soon after. Ian and Josh rounded without difficulty some time later and began their sail back upstream, which was uneventful and all four boats finished in the order that had emerged soon after the start. The total time was quite fast for a D-course: 89 minutes for Rob, and 108 minutes for Josh and Caroline. 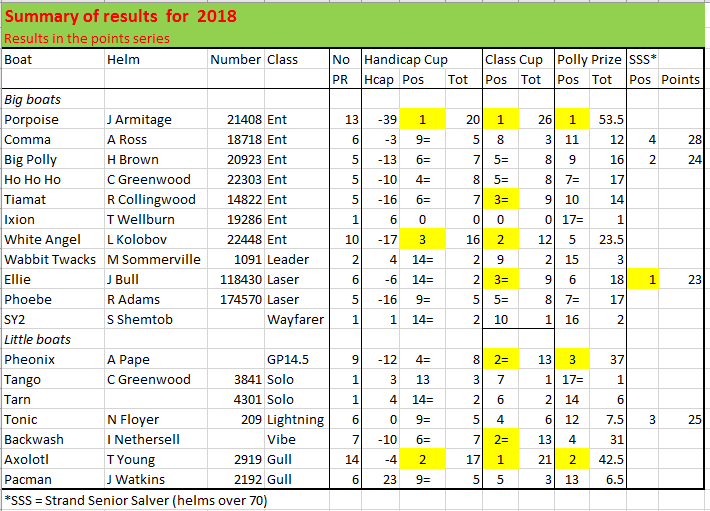 After the handicaps were taken into account Rob still won in all three series, with Ian sneaking into second place in the Handicap series ahead of James. Next week, Easter Sunday, it’s an A-course at 15:30 with the added incentive of an Easter Egg prize. An overcast day of very light and fickle winds, demanding some tactical sailing from the three entrants, James, Henry & Mary and Jane. We set a shortish two-mark course, allowing a fairly slow run downstream and a brisker beat back up, with the tide. 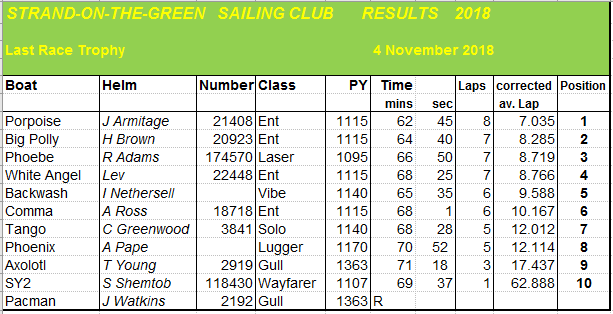 On the first lap, all three boats reached the downstream mark in close echelon formation, but thereafter, Jane’s Gull lacked the sail area to make the best of the light wind conditions. The water immediately after the upstream mark, in particular, seemed plagued by the doldrums. On the first lap, Henry found the wind here whereas James, seeking it on the Surrey Bank, was disappointed for a while and the lead switched. However, Henry was less fortunate with the doldrums thereafter, allowing James to steal almost a lap on him by mid-race. This pattern of lulls and relative spurts continued, dampened by intermittent light showers, until James crossed the line on his seventh lap 10 seconds short of the hour, Henry on his 6th a couple of minutes later, followed by Jane just a lap behind him a minute or so afterwards. The 31 March race was switched from a scheduled B course to an A after brief assessment of wind, and word of an impending river closure downstream of the railway bridge after noon. Four sailors turned out on a somewhat grey and occasionally blustery morning. Dave B, sailing Big Polly single-handed, rounded the downstream mark just outside the grid first and maintained the lead throughout the race. Rob C sailing Tiamat single-handed and Rob A sailing Phoebe followed round the mark soon after, however a gust pushed Tiamat over moments after. It proved impossible to right her, Rob C opted to retire and was attended to by Lev and crew and in the safety boat. Ian N in the Vibe had a slow first lap but then settled into a rhythm and was frequently seen leaning out far near the Surrey bank, making the most of the NE breeze. 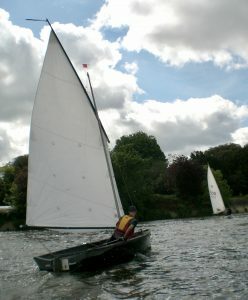 Rob A’s Laser appeared to have ever declining freeboard and was stopped in the shallow water at Middlesex bank on several occasions to drain water from the hull, before resuming the race and finishing 3rd after 4 laps. Ian was 2nd on the water, also with 4 laps. Dave’s mast came dangerously close to horizontal at the upstream mark on his 5th lap but after that, victory was never in doubt, and the whistle went after 6 laps completed around the hour mark. Many thanks to Lev, and Dave (x2) in the safety boat and Chris and James off the water. 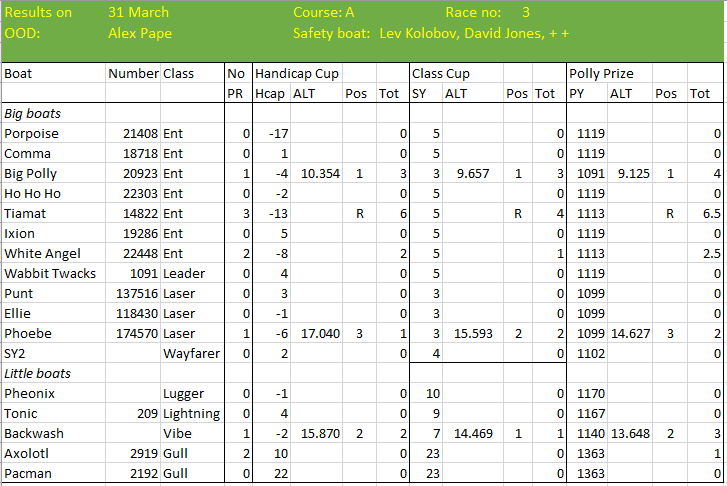 Second race of the 2019 season and the first points race. A cold but dry day with a westerly F2 wind, gusting F4. A scheduled C course was changed to an A course to suit the wind direction and the lack of time to pass under Kew Bridge. The time of HWKB was checked, approx. 11am and it was agreed that a start of 10am would be fine. Three boats prepared for the race – Robert with Josh (new member) in Tiamat (E), Lev sailing solo in White Angel (E) and Tim in Axolotl (G).The course was set – 3 buoys, Bell and Crown pub, City Barge pub and the Kew Bank rowing buoy, with Ian in the safety boat with the assistance of Henry Brown and David Jones. The race started at 10.06. Tiamat and Axolotl raced away with Lev struggling to find the wind to cross the start line. Sailing was close between Tiamat and Axolotl rounding the first buoy together. Axolotl choosing to take the Kew Bank behind Oliver’s Island with Tiamat tacking upstream on the Strand. In the meantime, Lev in White Angle had capsized. However, Lev quickly righted his Enterprise, bailed out and continued on to round the first buoy. Tiamat was moving further ahead of Axolotl, although Axolotl’s move behind the Island did not lose too much ground. Tiamat rounded the next two buoys and raced across the line at 14.16, Axolotl followed at 18.50. Race conditions were becoming difficult with strong gusts of wind and strangely the tide was turning early, only 18 minutes into the race. Lev in White Angel capsized again and again he quickly recovered but decided to retire. Tiamat and Axolotl continued to fight the gusts and now the strengthening ebbing tide, and because of the change in the tide it was decided to conclude the race at two laps. Tiamat managed to complete the second lap at 29.15. Axolotl continued against the tide, but behind the trot moorings, trying to reach the Kew Buoy, had the added difficulty of avoiding numerous rowers. In particular a fast moving eight, scary. He eventually retired at 58mins. But a great effort. An eventful race day, finished in the arch with the Commodore’PPs Rum and blackcurrant and good humour. The first event of the day was a ceremonial naming and anointing of our new safety boat, the ‘Kurt Berger’. The old Dory had been swapped for the new, bright yellow, Whaly 435 the previous Sunday and she lay under the bridge swathed in black polythene throughout the week. Today around a dozen sailors and friends wheeled it onto the top of the ramp where Margaret Berger did the naming honours in appropriate style with a thimble or two of champagne. She (the boat) had been immaculately inscribed with her new name by David Jones. Despite the number of sailors on hand there were, at first, no volunteers for the First Race. A cold F4 gusting F5 or 6 was blasting straight down the river against an incoming tide, and those present soon decided to launch and test the ‘Kurt Berger’, and nothing else. That was before Rob Adams heaved into sight in a dry suit and with an appetite for a challenge. So as the ‘KB’ was put through her paces with a crew of four including Margaret, Rob’s laser skated across the choppy water in an abundance of spray in an exhilarating display of seamanship. The safety boat served only as the platform for an admiring audience: rescue was not required. After 40 minutes or so both boats retired to the ramp where the ‘KB’ was man-handled up by a team of 6 or 8 into the yard. She is significantly lighter than the Dory. Rob Adams was, of course, awarded the First Race honours – it wasn’t his fault that no-one else joined in – and the assembly warmed up with tea, Margaret’s drizzle cake and Mary Brown’s flapjack. Next week it’s an early start (10:05) for an Isleworth race. An early start at 1000 did not deter 11 boats from turning out – the largest number for any race in 14 years. It was an overcast morning with a fitful SE wind of F3 coming straight up the river adding to a moderate tide. Rob Collingwood and David Jones put the downstream buoy just above the grid and the upstream one well clear of Kew Bridge. The Enterprises, tacking down against the tide, trying to make the best of the slower inshore waters, reached the downstream buoy first and the Browns, taking advantage of a slight wind shift, tried an oblique attack on it from upstream. The gamble failed, the wind dropped and the tide pushed them onto the buoy and forced a penalty re-rounding. James, crewed by grandson Ayanda, took the more cautious approach tacking downstream of the mark and established a lead which he maintained and increased throughout the race. At the end of the first lap James led the Browns by about 2 minutes followed by Andy and Enoch with Lev close on their transom. 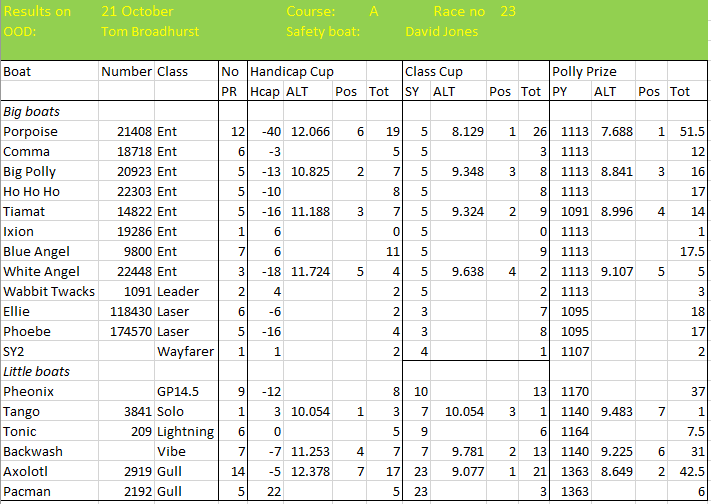 At the second lap James’ lead over the Browns was nearer 5 minutes and Rob Adams was less than half a minute behind. 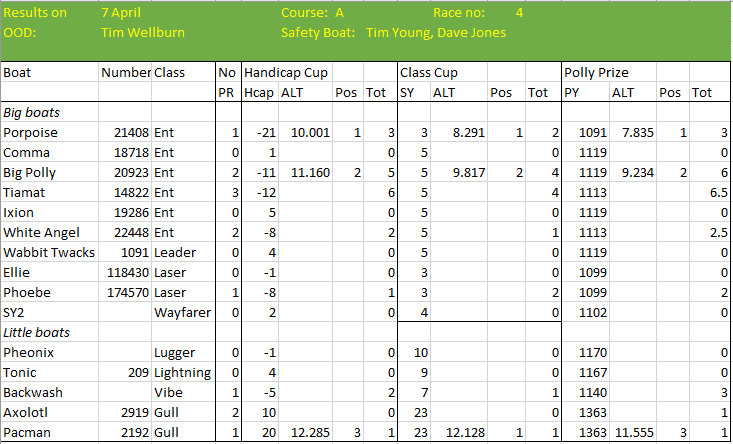 By the third lap Rob was 10 seconds ahead of the Browns with Lev in fourth place, and it was on the third lap that Chris Greenwood, on his second race in a Solo, capsized and took some time to get sailing again – wet and cold. That was the only drama of the morning, apart from the disappointment of Jane who had to be rescued by the safety boat from the perils of Kew Bridge. Rob maintained his narrow lead over the Browns for the next two laps and there were some interesting inshore tacking battles on the downstream legs. By the fifth lap of the leading ‘also rans’, James and Ayanda had worked their way through the fleet to lap everyone. A lap later the Browns had regained their narrow margin over Rob which they maintained to the end, and Lev, also on seven laps, finished fourth. 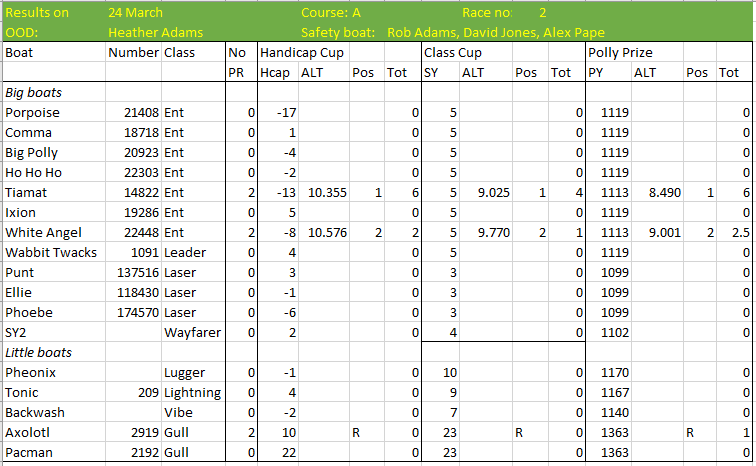 So James was the decisive winner with 8 laps, followed by the Browns, Rob and Lev on 7 laps, Ian and Andy on 6 laps, Chris and Alex on 5 laps, Tim on 3 laps, Sam Shemtob (late starter) on 1 lap and Jane a reluctant non-starter. Meanwhile, Mary Short was at work on the barbeque and a sumptuous feast was being prepared. Founder member Marthe Armitage was present as well as Margaret Berger with a delicious chocolate cake. Many thanks to Enoch for an immaculate record of a very crowded finishing line (he suggests that next time sailors should space themselves out more evenly), and to Rob Collingwood and David Jones for standing by in the safety boat. Sunday was a glorious day for a sail with blue sky and enough wind coming straight down the river from the Kew Bridge for a good race. David Jones, on advice from James, set a downstream buoy just above the City Barge and the upstream mark at the Café Rouge. The fleet of seven set off on the run shoulder to shoulder and there was some inevitable barging at the downstream buoy with quite a strong tide flooding. James, crewed by David Kolobov, got an inside line on the mark and was around and in the clear while the rest of us struggled to avoid each other and the mark. James completed his first lap in under 9 minutes, followed by three other Enterprises: first Rob Collingwood (sailing solo), then the Browns, then Lev Kolobov (also solo), all within a minute of each other. 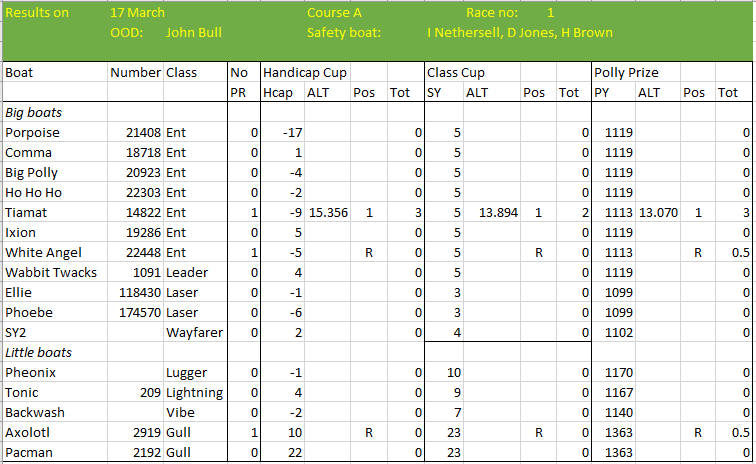 Chris Greenwood, having abandoned the rotting hulk of his Enterprise, tried out David Jones’ almost pristine Solo and duelled with Ian Nethersell for the rest of the race. Tim cruised contentedly in their wake. The course offered the choice of a long starboard tack across the river upstream of Oliver’s Island, mixing it with the rowers and a manoeuvring RNLI boat, or shorter tacks on the Strand side of the moorings. Neither showed a decisive advantage but most of the fleet tried the long one if only for the variety. James, as is his wont, gradually increased his lead and by the end overtook the three tail-enders and was only one second short of catching Lev. He completed 7 laps in the hour, followed 8 minutes later by Rob, a mere 11 seconds ahead of the Browns, with Lev about a minute behind. After 6 laps Ian finished fifth just over a minute ahead of Chris, with Tim about 6 minutes behind. 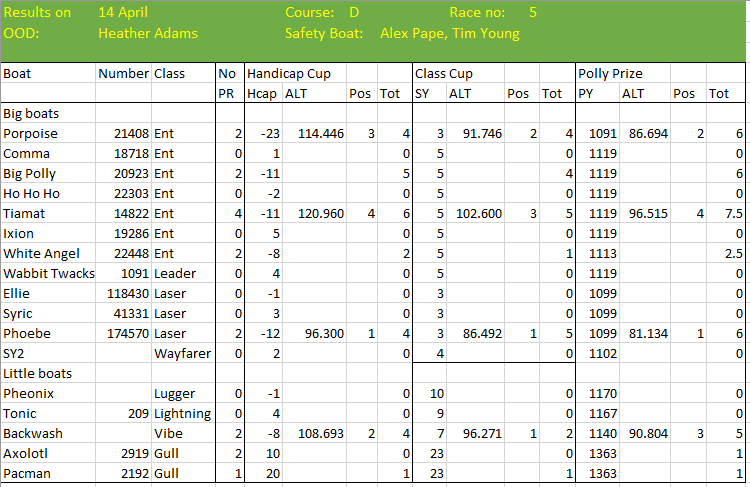 The various handicap calculations gave Chris the winning Handicap points, Tim the Little Boat points, and James the first position in the Big Boats and the Polly Prize. Many thanks to Tom Broadhurst for officiating, and to David Jones in the safety boat.